SPIN Club is a new term to our 4-H world. It is a new kind of 4-H club. With society changing with busy lives, the 4-H program has added components to efficiently and effectively try to meet the needs of our audiences. So 4-H is implementing a new club model for families that may not be able to participate in a yearlong club. The SPIN Club model has the flexibility to provide positive youth development over a short period of time as 4-H members. What is a 4-H SPIN Club? SPIN stands for Special Interest. e.g. photography, rabbits, volleyball, aerospace, etc. 4-H SPIN clubs allow youth ages 5 to 18 with common interests or hobbies to meet as a club and share their special interest. Whatever their passion is, youth can gain knowledge and enhance their skills through a positive group experience. A 4-H SPIN club can be started with a minimum of one adult volunteer and five young people with an interest in a particular topic. While the adult provides expertise and guidance, club members take an active role in planning and running their own activities. The SPIN Club meets over a short period of time, e.g. 6 – 8 weeks. Cass County has successfully launched 3 SPIN Clubs and have plans to begin the fourth. Youth attended the Dining Around the World 4-H SPIN Club where they learned about 6 different countries, prepared dishes and tasted the cuisine. Youth also attended the Board Game 4-H SPIN Club where they used their problem solving skills, luck and had fun learning new games. Youth actively participated in these clubs with a caring adult developing life skills. An Outdoor Skills 4-H SPIN Club has just begun where youth are learning about land navigation, animal identification, safety and first aid. Soon to follow, will be a Sand Volleyball SPIN Club and maybe more! 4-H is all about kids! 4-H is kids making friends and lasting relationships. 4-H is kids working together creating blankets to give to the homeless and singing Christmas carols to shut ins. 4-H is kids learning to build robotics or bird houses. 4-H is learning photography or cake decorating. 4-H is working with an animal whether it is a steer, rabbit or dog. 4-H is fair time and the excitement of entering exhibits, interviewing with a judge and receiving fair ribbons. 4-H is holding an office and running a club meeting developing leadership skills. 4-H is kids giving demonstrations enhancing their public speaking skills. 4-H is summer camp filled with activities, nature, friends and fun and learning to get along. 4-H is smiles and laughter, encouraging and bonding with one another. 4-H is kids working with caring adults to learn life skills. 4-H is kids reaching out to others. 4-H is all of this and so much more. It is a community of youth and adults working together to make our world a better place. 4-H is our investment in the future. 4-H is what our kids and our world needs today! Consider donating some time to the 4-H organization and help provide more kids the hands on experience, support and encouragement they need to thrive. Let’s watch our kids make the world a better place for all of us. 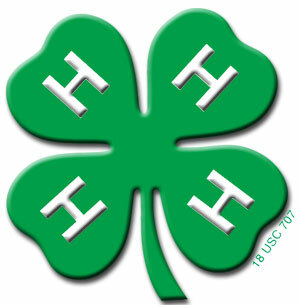 Welcome to a brand new year of 4-H activities and fun! I'm so excited to have our returning families and I welcome the new! It will be a year of great opportunities; to make friends, have fun, help others, participate in hands-on-projects, special group events and to grow in life skills. If you enjoy friends, families and doing fun things; then 4-H is the place for you! Being a 4-H volunteer is satisfying and can positively influence youth ages 5-18. Becoming a 4-H volunteer is not hard; however, it is important to start and complete the steps in a timely manner so that youth are engaged in the 4-H activities they signed up for as soon as possible. Applicants should strive to complete all volunteer application steps by December 1. A — Applicants (new and returning) need to ask local 4-H staff or middle management volunteer such as a club leader about current volunteer needs (e.g., co-leader for a 4-H club). Ask to see volunteer role descriptions to identify a role that might be a good fit. B — Build a new or, if returning, annually update your volunteer profile at http://mo.4honline.com --- You must answer YES to the volunteer question!! C — Complete the one-time 4-H volunteer orientation, if you are a brand new 4-H volunteer applicant. The orientation helps new applicants learn basic terms, organizational structure and safety practices. Please check back for upcoming Cass County events.